I went to Norman Brothers Produce today to see if I could get some local produce to take on my trip to Seattle as a gift for my friend Patricia Eddy, who aside from being a fellow Metblogger is also the creator of Cook Local, a website dedicated to championing local foods in the Seattle area. Normally she wouldn’t order anything from South Florida, but since we’re traveling there anyway, and it is local to us, we can share our bounty without her breaking the 250-miles-radius rule she’s established as her guideline. I used to shop a lot at Norman Brothers when I lived in Kendall, so I knew they were a great place to get local produce without short of taking a trip to Homestead. Boy, how have times changed. 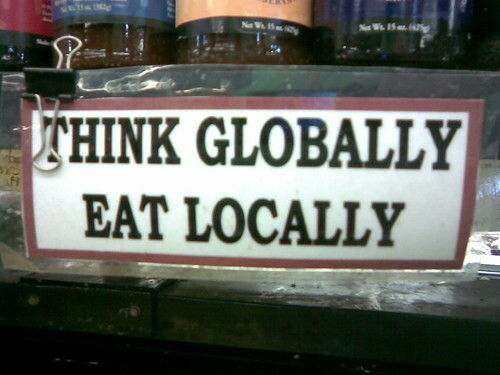 That sign was placed hovering above a selection of beans from (somewhere in) Florida and produce from California, Guatemala, Colombia, Peru and just a few bins down even some eggplants from Holland. I’ll let you savor the irony for a moment. I understand some thing are not in season, but it just seemed that more than 70% of their produce stock was not local at all (unless you also count “USA” as local, but I’m not at this moment), with a fairly disconcerting sub-percentage being from Latin America. I mean, plantains from Colombia? Mangoes from Brazil? Seriously? For the record, I did at least get two giant avocados from “Dade County,” a pound of Cubanelle peppers and a dragonfruit, these last two from Homestead. I wish I could have gotten a couple pounds of stone crabs to take to my friends, but I needed those packaged for a plane trip and this was not something they could do at the seafood counter, nor I at home since I cannot bring stone crabs into my kosher kitchen. Oh well. Norman Brothers, if you’re gonna have this phrase as your official slogan (as featured on the front page of the website), you gotta do better than this. I’ll have to return to the store later on to see if this was a one-time fluke, so expect a follow-up post sometime down the road.